Messier 106 (M106) is a spiral galaxy located in the constellation Canes Venatici, the Hunting Dogs. M106 lies at a distance of 23.7 million light years from Earth and has an apparent magnitude of 9.1. It has the designation NGC 4258 in the New General Catalogue. Messier 106 occupies an area of 18.6 by 7.2 arc minutes of apparent sky, corresponding to a spatial diameter of 135,000 light years. It is similar in size and luminosity to the Andromeda Galaxy (M31) and is one of the brightest, largest nearby galaxies. M106 has a high surface brightness and can be seen in binoculars, which reveal a faint patch of light. Small telescopes show a diffuse patch with a brighter centre, while 8-inch telescopes reveal more details of the galaxy’s structure. 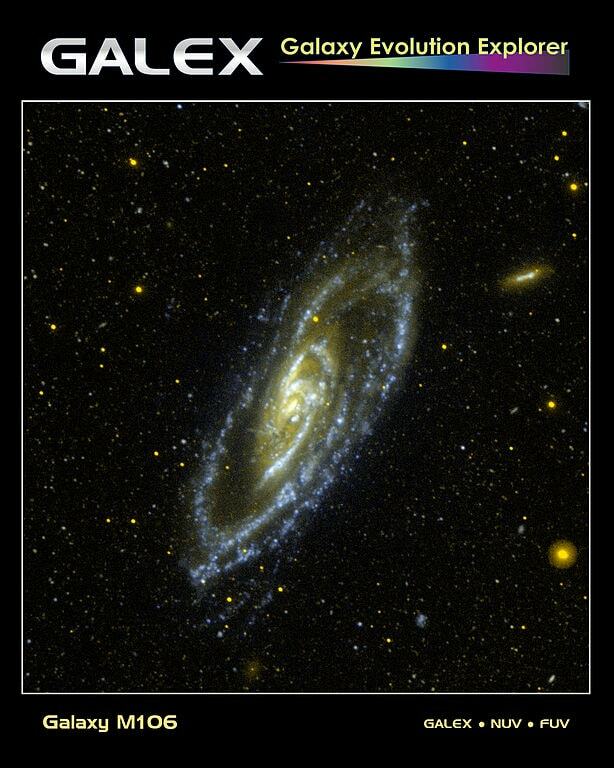 Large amateur telescopes show the galaxy’s spiral arms. Messier 106 lies along a line drawn from Phecda (Phad), Gamma Ursae Majoris, the star marking the bottom of the Big Dipper toward the handle, to Cor Caroli, Alpha Canum Venaticorum, the brightest star in Canes Venatici constellation. 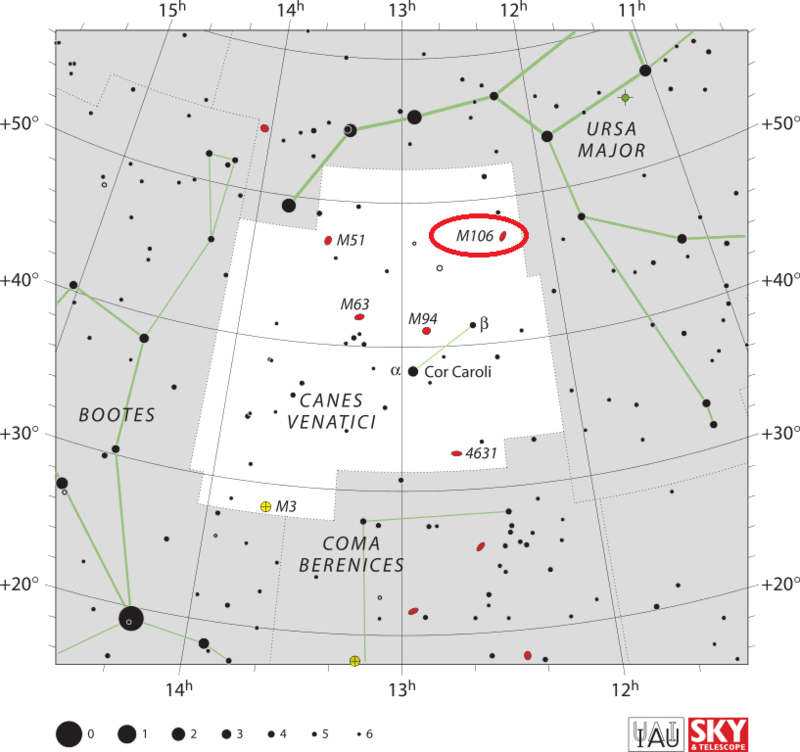 M106 can also be located by extending the line from Dubhe, Alpha Ursae Majoris to Phecda. Dubhe is the northern of the Pointer Stars, the two stars of the Big Dipper that point the way to Polaris in Ursa Minor. 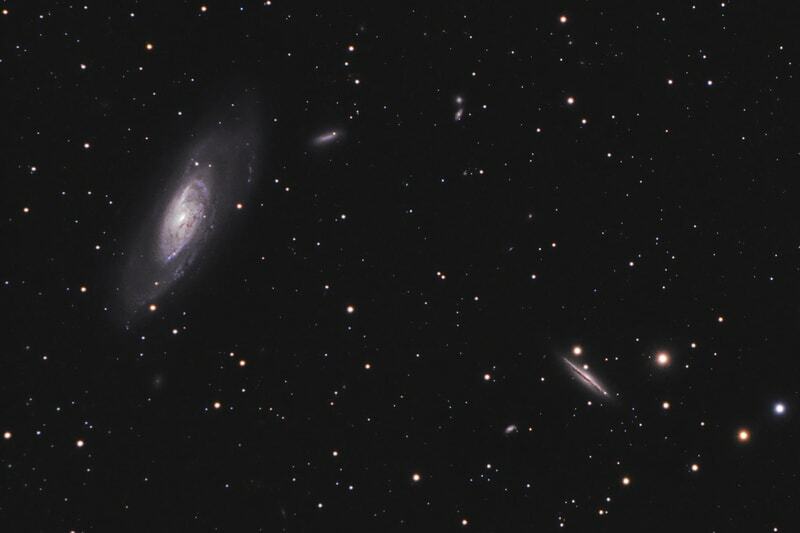 Messier 106 can also be found using Megrez, Delta Ursae Majoris, the faintest star of the Big Dipper asterism, which connects the Dipper’s bowl to the handle. 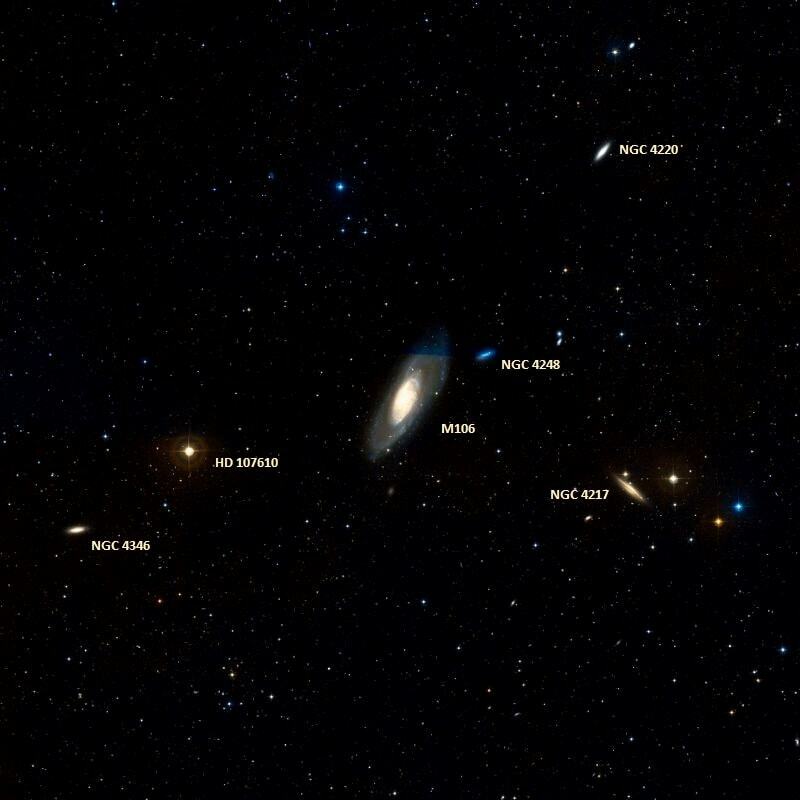 The magnitude 4.8 star 5 Canum Venaticorum (5 CVn) lies 5.5 degrees south and a little east of Megrez and M106 is positioned a little over 4 degrees to the south of 5 CVn. The best time of year to observe M106 is during the spring. The galaxy is a challenging object for southern observers because it never rises very high in the sky. Messier 106 is classified as a SABbc type galaxy, which means that it is an intermediate between a normal and barred spiral galaxy. It is home to at least 400 billion stars. Messier 106 is also classified as a Seyfert II galaxy. It has a considerably larger extent in radio than in visible light and exhibits emission line spectra from the nucleus. M106 shows unusual emission lines and X-rays, indicating that a portion of the galaxy is falling into a central supermassive black hole. The galaxy has a thin, slightly warped disk that appears almost edge-on. The disk surrounds the galaxy’s central region. Observations with the Very Large Baseline Array radio telescope in 1995 revealed that M106 may contain massive dark objects, with 36 million solar masses contained within a volume of about 1/24 to 1/12 light year radius. At the time, this was the densest concentration of matter ever discovered. M106 is a maser galaxy. It has a dense disk that works as a maser (Microwave Amplifier by Stimulated Emission of Radiation). A maser is a microwave laser, or a laser that operates in microwave instead of visible light, on a galactic scale. 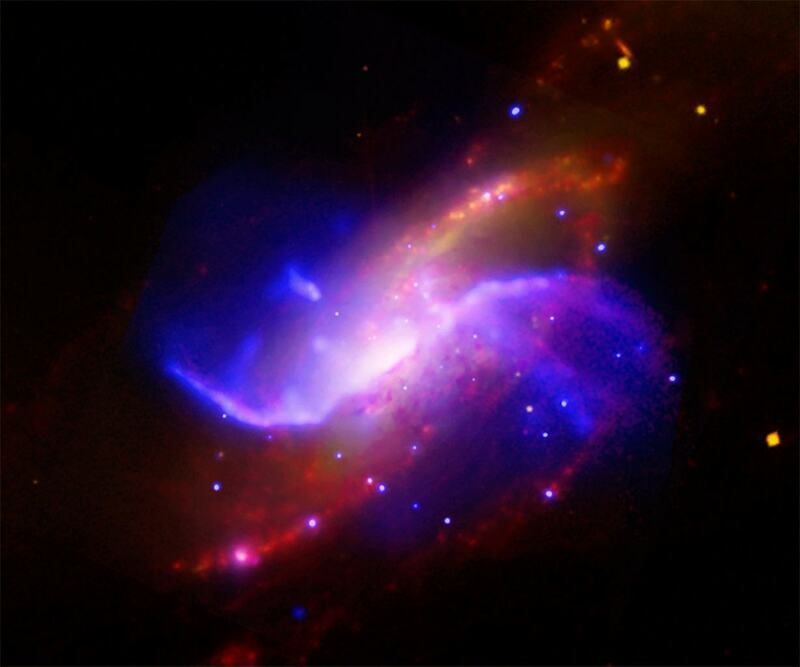 The nuclear megamaser ring, which made it possible to directly measure distance to a galaxy for the first time, is responsible for M106’s purple colour. Messier 106 may have a companion galaxy, the spiral galaxy NGC 4217. NGC 4217 is about 80,000 light years across and appears almost perfectly edge on. Messier 106 is the largest member of the Canes Venatici II Group (CVn II Group), a group of galaxies in the Local Supercluster, located at a distance of about 26.1 million light years from Earth. 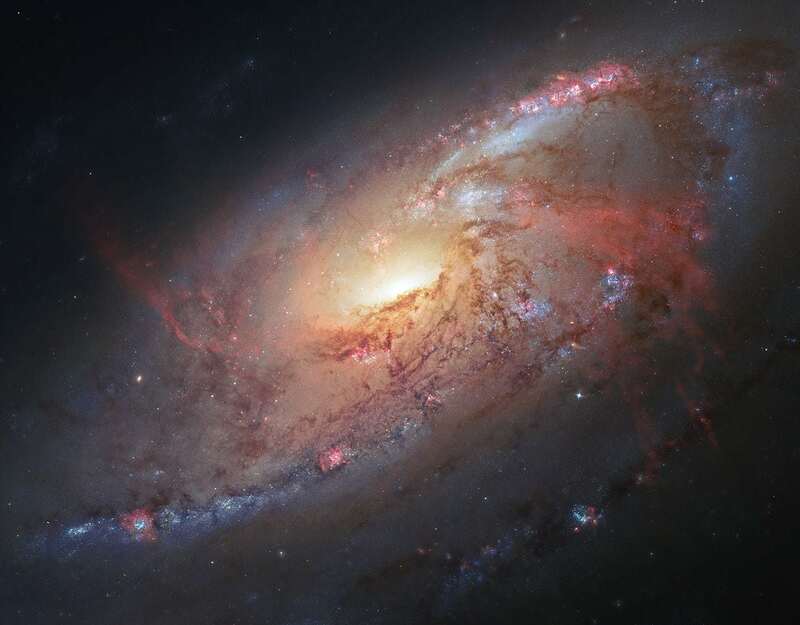 Two supernovae have been discovered in M106. SN 1981K, discovered in 1981, reached 16th magnitude and SN 2014bc, detected on May 20, 2014 at magnitude 14.8, was classified as a Type II supernova. In July 1781 I found another nebula close to the Great Bear near the star No. 3 of the Hunting Dogs and 1 deg more south, I estimate its right ascension 181d 40′ and its northern declination about 49d. I will be going to determine the more accurate position of this one shortly. The galaxy, however, was not included in the Messier Catalogue until 1947, when Helen Sawyer Hogg added it along with M105 and M107 based on Méchain’s letter. Very brilliant. Bright nucleus. With faint milky branches north preceding and south following. 15′ long and to the south following running into very faint nebulosity extending a great way. The nucleus is not round. From 22 million light-years away, galaxy M106 extends two ultraviolet-bright spiral arms in this image from NASA’s Galaxy Evolution Explorer. M106’s extended arms are the blue filaments that curve around the edge of the galaxy, creating its outer disk. Tints of blue in the galaxy’s arms reveal hot, young, massive stars. Meanwhile, traces of gold toward the center reveal an older stellar population and the presence of obscuring dust. From 24 million-light years away, neighboring galaxy NGC 4248 can be seen sitting just right of M106. The irregular galaxy looks like a yellow smudge, with a bluish-white bar in the center. The galaxy’s outer golden glow indicates a population of older stars, while the blue central region shows a younger stellar demographic. A large white nebula, closely following the haunches of the Greater Bear, discovered by WH [William Herschel] in 1788, and No. 1175 of his son’s Catalogue. It is a noble-sized oval, trending rather from the vertical in a direction np [north preceding, NW] and sf [south following, SE], with a brightish nucleus in its southern portion; the lateral edges are better defined than the ends. It is preceded by two stars of the 10th magnitude, and followed by two others; and there are also some minute points of light in the field, seen occasionally by glimpses. This object was carefully differentiated with Alkaid; and its place will be indicated by a running diagonal line across the square of Ursa Major, from Alpha through Gamma, and carrying it 7 1/2 deg into the south-east, that is, a little less than the distance between those stars. With the very faint extensions this spiral is nearly 20’x6′ in p.a. 165deg; very bright, elongated nuclear portion, on the west of which a short dark lane; there are numerous almost stellar condensations in the two principal spiral branches.